Spirits and Minds Grow Here! 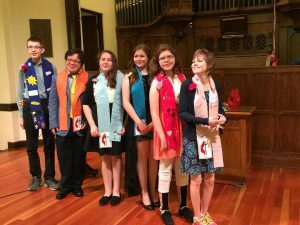 PPUMC strives to be an open spiritual community dedicated to allowing each person to follow their own unique path. Together, through worship and Christian education, we explore the many pathways to wholeness in body, spirit, and mind. 11 am – noon Senior High Youth Group, grades 9-12 (September- May) +Senior Youth participate in special projects on a periodic basis. Do you wish for more community in your life and the lives of your children? Would you like your children to have….? 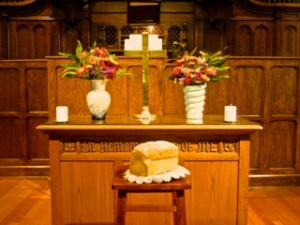 If these things intrigue you, Prospect Park United Methodist Church may be the place for you. Visit us for a few Sundays, come now and then, or become a regular member of our community. Sunday School for PreK-8 meets every Sunday from 10:00-11:15 AM during the school year (September – May). Sunday School starts in the worship service where children participate in the opening call to worship, a song and a children’s time. Around 10:20 they head downstairs for age appropriate educational activities. Senior High Youth Group meets every Sunday from 11 am – noon. This group begins with snacks—fortification—and then retreats to the Balcony Youth Room for activities and edification! The season will include service projects, fun activities, and studying New Testament stories. 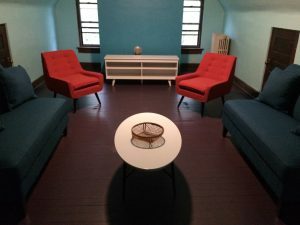 Pictured left: the balcony youth room, refurbished in the fall of 2018. Adult Education & Enrichment discussions are held from 11:30 AM – 12:30 PM most Sundays, September-May for any and all adult spiritual seekers! Adult Education belongs to the learners. The group will engage in bible study during the fall learning hour. Adult Education, during the Sundays in Lent, centers around a selected text that participants read and discuss together.